The sciatic nerve is the longest and largest nerve in our body, and it is formed by the roots that are branching out of the spinal cord in the lower back. These roots get together and go down along the back of your legs. So, when the sciatic nerve gets compressed, irritated or pinched anywhere in between, then you are going to feel the pain. When it comes to the most common cause of sciatica nerve pain is the bulging disc, which is commonly known as the herniated disc as well. You can get treatment for sciatica nerve Melbourne at affordable prices now. There could be a number of phases that people are going to experience while they are suffering from sciatica. The pain is going to be sporadic or constant, mild or shooting. The pain is going to aggravate when you a cough, sneeze or make small movements. People who have taken sciatica Melbourne treatment know how tough it is when it is paining. The pain doesn’t come alone, but it brings a few other irritating elements as well such as numbness, tingling sensation or muscle weakness in the leg or foot. Now coming to the symptoms of sciatica; they are going to subside in a month or two. You have to take enough rest along with muscle relaxants in order to alleviate the pain. 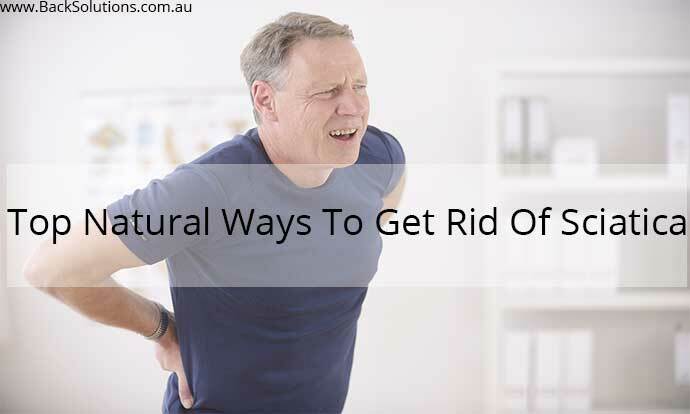 There are multiple ways of reducing the pain, but if you want to get rid of the pain through natural ways, then here are some for you. You can apply a heat pack on your lower back to relax the strained muscles and improve the blood circulation. If you don’t have a heat pack, then take a steamed towel in place of that or if you want, you can sit in the bath that is filled with warm water for 15 minutes. Do this a couple of times in a day and you will experience relieve. Apply ice packs on the damaged area for 15 minutes as it will help reduce the swelling around the sciatic nerve and also numbs the pain. Massage is an evergreen method for treating any pain, so how can you ignore massage therapy when it comes treating sciatic pain? So, you can get great relief by getting massage therapy. You can get in touch with Back Solutions Clinic to get the best massage therapy for Sciatica Melbourne. If you are looking to get your spine adjusted, then you better take chiropractic treatment. This will help restore all the misaligned vertebral parts of the body and also bring the spinal column into its proper position. Get the best Chiropractic treatment for sciatica Nerve Melbourne at Back Solutions Clinic. There are various types of oils and creams that are available today, which you can apply to reduce the pain occurring in your lower back, thighs or legs. You can get more information about the best topical oils on the web.